I grew up eating healthy home-cooked meals which my mother and on some occasions my father would prepare. Time came that they had to leave me and my siblings to work abroad. I remember, in one of their letters to me, my father mentioned how much he missed sipping the hot soup from Sinigang and he wished to fly back to Manila from Saudi Arabia and share the dish we'd regularly have which my grandma would cook for us. Growing up with parents, aunts and a grandma who heartily cooks meals for us, I knew I would also do the same when I become a parent myself. One of the trick I learned from them is using commercial products that enhances the flavor of our dishes. Hence, growing up with Knorr cubes and seasonings. I'm happy to tell you that, yup, my kids now are enjoying the fruit of my eating experience at home. With Knorr Sinigang as his souring agent, cooking our favorite version of Sinigang is a breeze for him. We love Sinigang, not only that it's an iconic home dish, it's a mesh of different flavors and textures in one bowl. Plus, how could I not mention it's health-giving benefit with all the vitamins and minerals packed in each vegetables that make up the soup. But do you know, there are other versions of Sinigang you can cook for your family? I only know a few like the Pork Sinigang, Sinigang na Isda sa Miso, and Sinampalukang Manok. I also tried a gourmet version of Sinigang at Namnam - Sinigang na Beef Short Ribs and Watermelon. What I thought I can only have in restaurants, we can now prepare in our own kitchen. 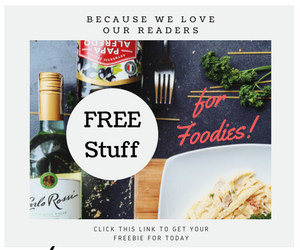 I'm sharing the recipe here. But before that let me just share how I was able to learn to prepare this. 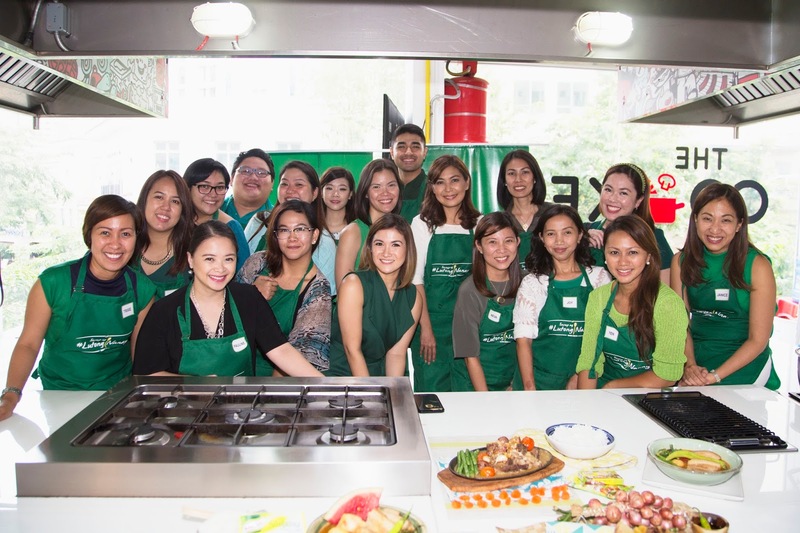 All thanks to Knorr for inviting me to be part of the league of moms vouching for Knorr products. 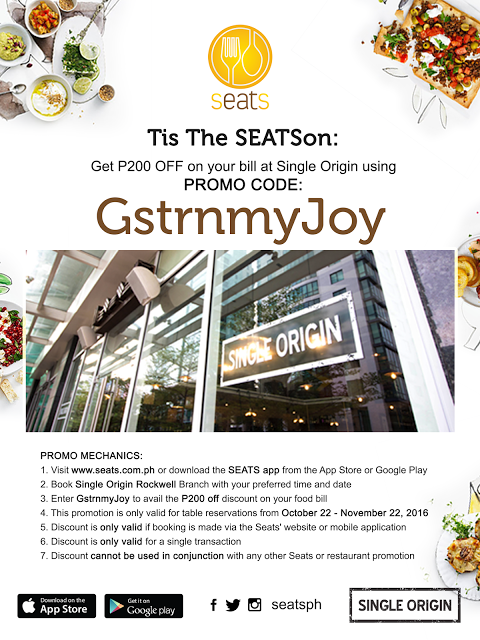 Last July 4, 2016, together with mommy bloggers and foodie influencers, we all gathered at The Cookery Place in BGC, Taguig. Now on its 3rd year, Knorr Lutong Nanay continues to champion delicious, home cooked meals for the Filipino family, especially in this day and age of eating out and instant food. More than 10 bloggers participated in the event. 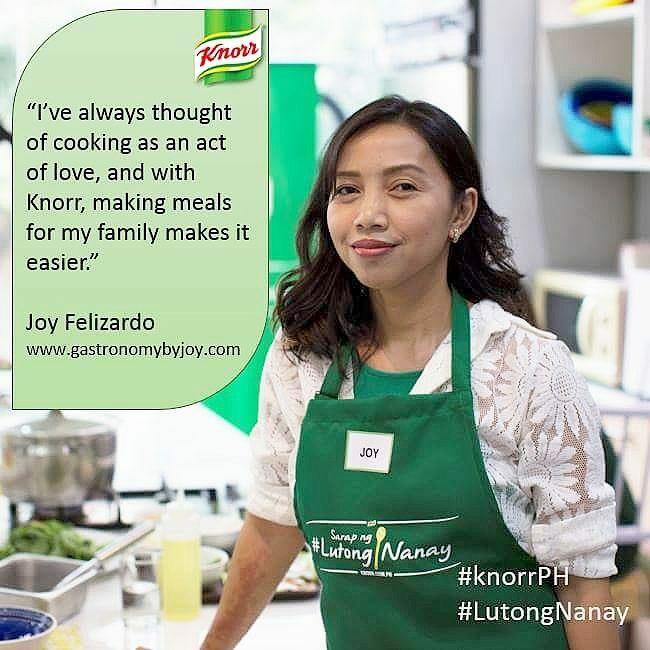 Knorr Lutong Nanay is a campaign with a goal to bring back the value behind home-cooked meals especially since people choose to eat outside or even alone in this fast-paced world. 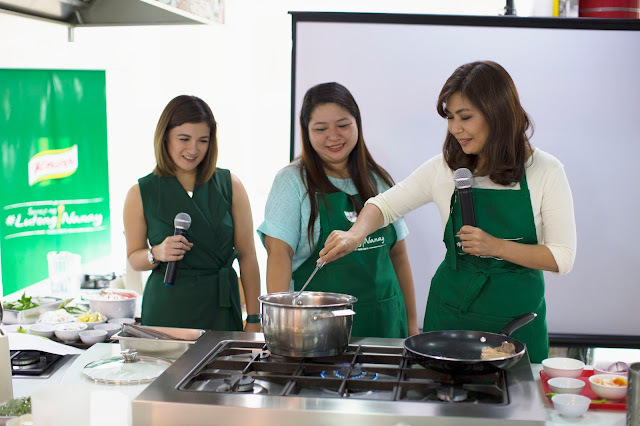 Knorr aims to help more moms bring the family together through the best flavors in their cooking.” The Lutong Nanay campaign also helps busy and working moms find time to cook for her family by introducing simple, smart and great tasting dishes that the family will love through recipe inspiration. “Cooking is a force for good. 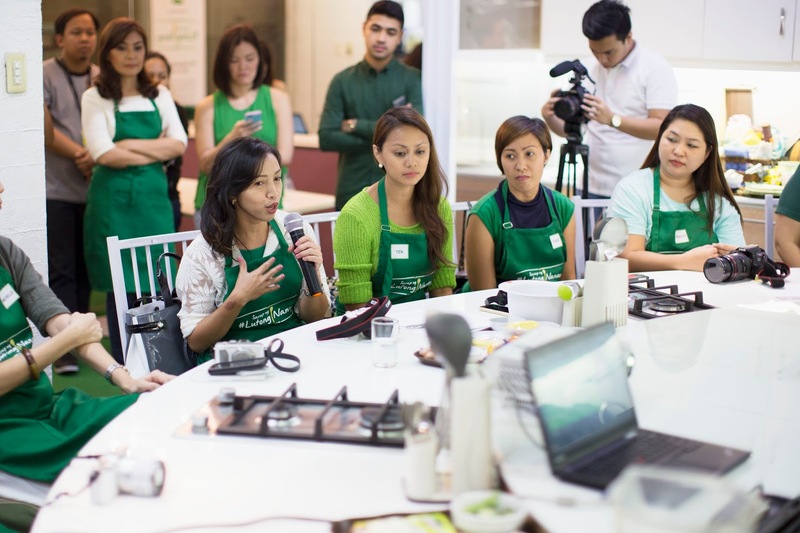 When a mother cooks, it is often seen as a way for her to ensure her family’s well being – and through Knorr, moms can serve nutritious meals without sacrificing great flavor” Czarina de Leon-Manalo (Knorr's Senior Brand Manager) stated. With the doting mother herself, Camille Prats, made us all moms welcomed. The event started with introducing ourselves and sharing stories, tips and family favorites with the group, so did the host. 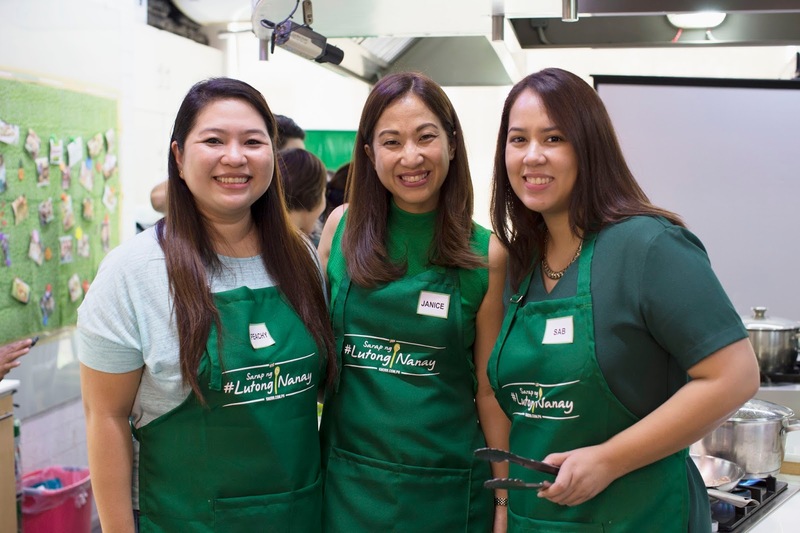 The group sharing was then followed by a short brand presentation on Knorr #LutongNanay with special focus on Sinigang, an all-time family, not to mention, kiddie favorite that makes everyone eat more rice, vegetables and soup. Then, Sari Jorge, renowned chef and businesswoman behind 25 Mushrooms Kitchen, did a cooking demonstration on different Sinigang variations, after which, the participants cooked and plated different Sinigang dishes. I'm super duper excited to try to cook them all for my family. You see, we can be utterly outrageous or adventurous in our meals and I'm 100% sure these new dishes will be my kids new favorite versions of Sinigang. Here are the unique Sinigang variations each team of bloggers worked on, of course with the assistance of Chef Sari. Cooked and plated by Michelle of My Mom Friday, Yen and Patty. 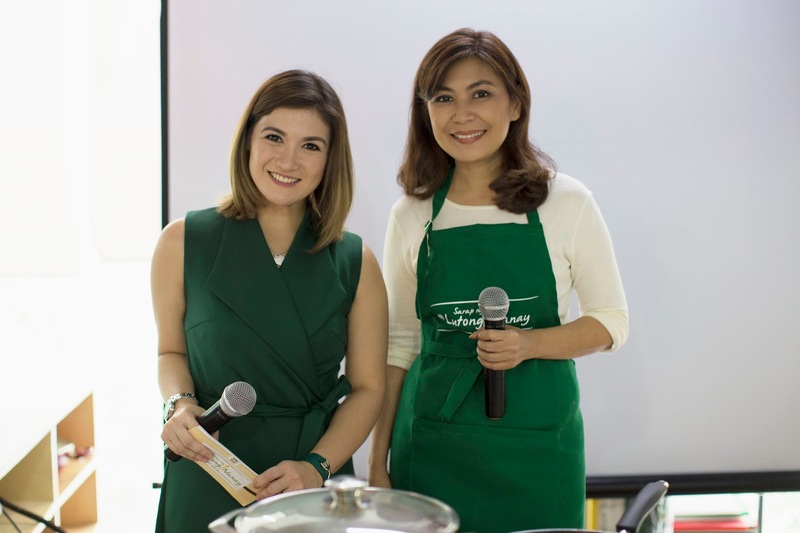 Together with fellow mommy bloggers Neva and Rowena, we made sure to live up to the demands of this intriguing and equally challenging dish. I didn't realize, you could combine seafoods and meat in one Sinigang pot and it did work and it was delish, specially with the Knorr sinigang mix fainting the seafood flavor which can oftentimes be overwhelming. 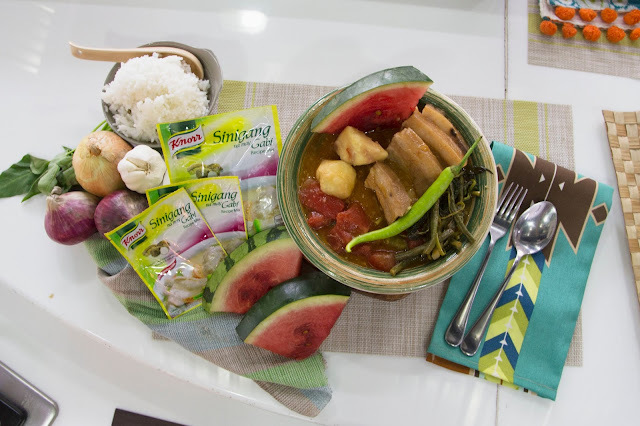 The star dish of the day is version that may be a best-seller in some restos, Knorr Sinigang with Pakwan, with the watermelon giving a hint of sweetness to the soup base and added more vitamins and minerals in every sip. 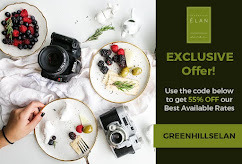 Attendees got a share of each featured dishes and might I say, they were all sumptuous and it would be a lot of fum trying them out at home, andI can't wait to see my kids' reaction. Now, let me do the honor of sharing you the star dish as learned from Chef Sari. 3. Reduce the heat to medium. Add the garlic and onions to the casserole. Add the tomatoes, ginger, lemongrass, gabi and watermelon and cook for 2 minutes before returning the pork to the casserole. 4. Add the water, Knorr Sinigang sa Gabi Mix, Knorr Beef Cube. Cook for a further 1–1½ hours until the pork is tender. 5. When the pork is tender, remove the pork from the casserole and set aside. Strain the liquid and add the fish sauce, soy sauce and pepper to taste. 6. Add the remaining watermelon, beans, chilies, and okra and cook for 20 minutes, before adding the water spinach and cooking for a minute until all the vegetables are tender. WOW! Looks like you guys have lots of fun :) Have a great week! Hi Aldora, yes we surely did!